(Edit in progress) From way back in 200x these are 7 Eleven redeemed puzzle items? Stylised designs inspired by 4 signature mobile suits from the original MSG 0079 anime show. Cute retro looking and very easy to "transform". Minecraft - block like character designs. They have a Coca Cola branding on the back. Probably the sponsor for some promotional event. They have a hole you can use to thread the matching coloured tag that comes included. 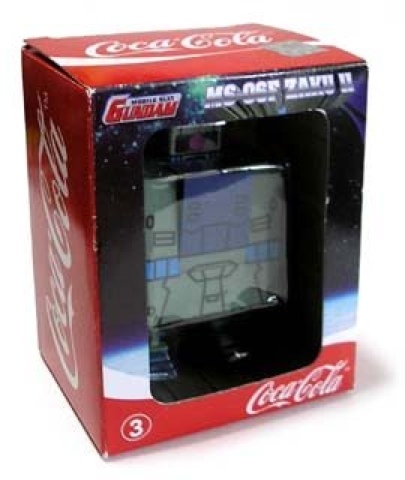 I've shown the green Zaku II Cola Cube but have since acquired the RX78-2, the GM and Char's Custom Zaku II making a complete set. Other than the printed adornments, they are all pretty much the same mold and share the same transformation. Only the command antenna of Char's custom and the Gundam's V fin being minor physical differentiators. The coloured plastic cube is a simple blank canvas with variations in their colourful patterns printed on them. To the artist's credit, these caricatures definitely work since you can easily tell exactly what iconic MS each block is trying to represent. They are well made. No paint chips on mine so far and the hard plastics seem pretty sturdy. Something odd for the collection. If these were ever made available outside of Hong Kong let me know. 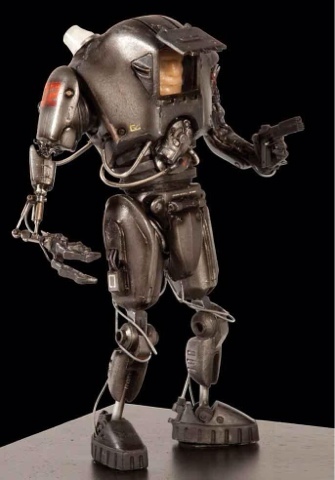 Robocop 2 original movie stop motion puppet! Circa 1990, for me, the most memorable piece of animated stop motion robot monster villainy to ever grace the silver screen and the last before CGI took over. Ed209 was great. Robocop2 trumps it. So much character in its movements, unfathomable detail in the miniature... I love me some metal pistons in a robot. Just jaw droppingly awesome in its design and execution in bringing it to life. The 2nd movie as a whole did not work as well as the 1st, but when I think of Robocop2, its just loads and loads of lovely meticulous labour intensive stop motion. The likes of which we will likely never see again. 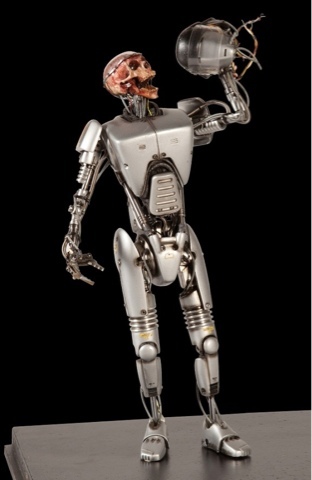 Hot Toys has a figure in the pipes... Ready 2012/13??? Expect it to be massive and expensive. built out of machined steel, aluminum, resin and cast plastic, meticulously hand-painted and detailed. Measures 15 in. tall x 10 wide x 9 in. deep. film. Despite its limited animation in the scene, it is in itself a fully animatable puppet with rotating lights and a miniature face behind the helmet. This puppet is unique and was never duplicated. Measures 13 in. x 6 in. x 6 in. Failed Robocop 2 "prototype B"
I want an action figure of this. In fact I'll take one of each of those failed Robocop 2 prototypes. (Orion, 1990) This RoboCop 2 Prototype B stop-motion puppet can be seen pulling off his helmet during the film. 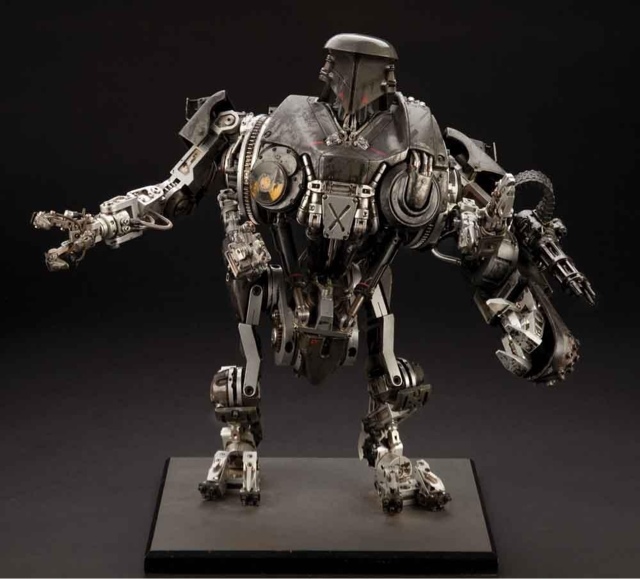 Just like his other failed companion, this stop-motion puppet is constructed of a fully articulated and unique armature of steel and aluminum components. Measures 13 in. x 6 in. x 6 in.